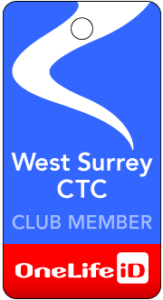 Please note that the Annual Dinner and Awards Presentation will now be held on Saturday 1 March 2014 and not 25 January, which was mentioned as the likely date in West Surrey Cyclist. The recent flooding has caused the venue to change as well, and it will now be held at the Princess Royal in Runfold, post code GU10 1NX. Full details may be found on the blog here.